Intel's new 1 petabyte storage drive that fits a 1U rack is just one of a slew of new memory form factors and technologies we’ll be seeing in the future. 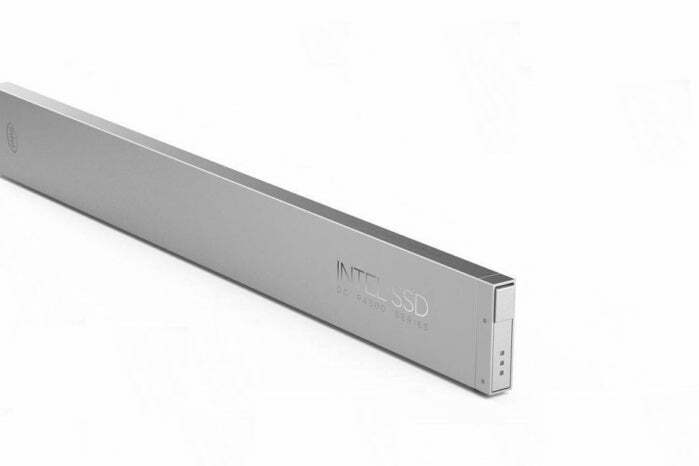 In a push to improve storage density, new, oblong-shaped solid-state drives (SSDs) are coming from Intel by the end of the year, the company has announced. It’s just one of a bunch of new memory forms and technologies that we’ll be seeing in due course, though. Intel’s “ruler” style drives are designed to slip neatly into a standard rack. The concept abandons the premise that memory products should look like traditional magnetic hard disc drives (HDDs) or Peripheral Component Interconnect Express (PCIe) expansion cards. Intel says its elegant, narrow rack-oriented design will ultimately allow for 1 petabyte of storage in a 1U rack. (A petabyte is a thousand terabytes (TBs), which is a thousand gigabytes.) That would be enough to hold 70 years of uninterrupted entertainment, or 300,000 movies, the technology supplier says. For comparison, to obtain a petabyte of storage using 10TB capacity HDDs, one would need a 100-bay 4U server, according to Techgage, which wrote about Intel’s announcement earlier this month. “The new form factor delivers the most storage capacity for a server, with the lowest required cooling and power needs,” Intel says in its press release. Storage density is a hot subject. Experts say massive levels of data density savings will be required in the future because our insatiable demand for data is going to overrun existing storage tools available. Indeed, storage density improvements might become as important for tech development in our data-intensive future as battery chemistry advancements are thought to be now — we’re limited by what we can do in IoT networks, for example, by slow, aging and cumbersome batteries. The race is on. Last month I wrote about an experimental way of using dyes to store data in a four-symbol code, replacing binary. The scientists working on that project say density savings can be obtained — optical data with new codes will be able to be crammed into much smaller spaces than can be achieved now. Energy-efficient storage is also on the data-centric wish list and may be as important. Collecting ever more marketing, artificial intelligence and other data can’t simply swallow unlimited amounts of energy. Low-power magnetic storage is one thrust universities are pursuing. Ideally that tech should perform processing, too. A university in the U.K. announced earlier this month that it has made a surprise breakthrough in that area. It’s been working on a kind of magnetic rotation, called chirality. Magnetic domain walls, as the technology is called, function in a rotating manner similar to the way a vortex is created when water drains, the University of Nottingham explains in a press release. Those researchers say they have been able to use electric fields rather than inefficient magnetism or electrical current to control the memory. That could make the power-saving future tech much cheaper. Magnetic random access memory (MRAM) is another magnetic storage medium that shows potential. Traditional RAM is not energy efficient. A Russian university said this week that it has developed an MRAM magnetoelectric memory cell called MELRAM that “will reduce bit-reading and -writing energy consumption by a factor of 10,000 or more,” the Moscow Institute of Physics and Technology claims in a press release this week. That storage uses magnetism in two binary-friendly directions, with each magnetized direction representing either the one or the zero. Additionally, it doesn’t lose information when power is turned off.